3. Open the lid of the center pocket. 4. Wrap a cloth around the tip of a small flattip screwdriver. 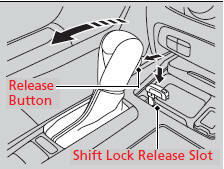 Put it into the shift lock release slot as shown in the image, and remove the cover. 5. Insert the key into the shift lock release slot. 6. 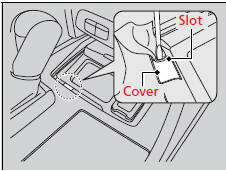 While pushing the key down, press the shift lever release button and place the shift lever into .